Three new content packs focus on challenge and coinage. Nintendo has traditionally been cooler towards DLC than its Microsoft and Sony counterparts, but it's apparently time for the Big N to warm up. New Super Mario Bros. 2 is the company's latest release starring its mustachioed mascot, and while its reviews generally agree that it doesn't tread a lot of new ground, Nintendo believes that its fans want even more Mario. Three DLC packs will arrive in Japan on October 2, all of them aimed at Mario veterans who want a bit more challenge out of his recent 3DS adventure. The first pack, "Gold Mario Go! Go!" 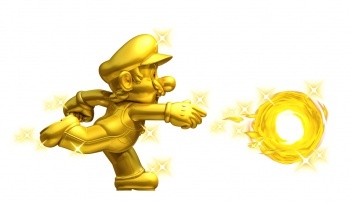 focuses on the game's Coin Rush mode, and will feature three stages whose riches total 30,000 shiny bits of currency. "Challenge the Record" provides players with three timed levels that encourage players to go for a high score. Nintendo will post the best scores on its website, so leaderboard aficionados should take note. Finally, "Survival Panic" will include some of the most difficult levels that Nintendo has devised for New Super Mario Bros. 2. Each one will retail for approximately $2.50. As there is no Western release date for these packs yet, it's anyone's guess as to whether they will make it across the Pacific. Nintendo has generally been good about releasing big-name titles in all regions, but DLC for its mainstay properties is still a fairly new concept. If Japanese Nintendo fans can get behind shelling out another $7.50 for Mario (and they probably can), the rest of the world should get its chance soon enough.